MICHIGAN STATE UNIVERSITY administrators have long claimed, to the federal government and public, that they have handled sexual assault, violence, and gender discrimination complaints properly. Over the past three years, MSU has three times fought in court -- unsuccessfully -- to withhold names of athletes in campus police records. The school has also deleted so much information from some incident reports that they were nearly unreadable. In circumstances in which administrators have commissioned internal examinations to review how they have handled certain sexual violence complaints, officials have been selective in releasing information publicly. In one case, a university-hired outside investigator claimed to have not even generated a written report at the conclusion of his work. And attorneys who have represented accusers and the accused agree on this: University officials have not always been transparent, and often put the school's reputation above the need to give fair treatment to those reporting sexual violence and to the alleged perpetrators. There's much more but essentially one can surmise from the details included that Dantonio isn't gonna survive this and Izzo might not either. This sounds like another Penn State where people knew things were going on but did nothing about it. You can't imagine anyone in power at MSU is going to survive this and probably shouldn't. Starting to think these types of issues may be wide spread throughout college sports. If so it's a shame!!! It’s almost like not giving Penn State the deserved death penalty didn’t set an example that would discourage covering stuff up. Same crap is going to happen here. A couple people will resign in disgrace with no real punishment to the university. And if MSU did a similar coverup give them the death penalty. An example must be set. I have no doubt about it. We'll probably never find out for sure until years from now. Oh I think its widespread through sport in general. Heck its rampant in Hollywood and being exposed right now. Frankly, I think its better now that what it was in the past. In the past, without all the social media avenues, the powerful could bury these stories rather easily. Scuttlebutt on Twitter is that both Izzo and Dantoni will retire soon. I said a few months ago when this thing got rolling that accusations would probably come from all corners and that we'd occasionally be shocked at who was being accused. Do it right this time...death penalty. Anybody got rope and a strong Oak tree? Hang the bastards. Turns out NCAA president Mark Emmert knew about the assaults in 2010 but did nothing. I remember that Dantonio, in one of his first actions as head coach at UC, handed out "playbooks for life" to every player, just as Tressel was known to do at OSU. It would seem that that version of Dantonio was a facade. 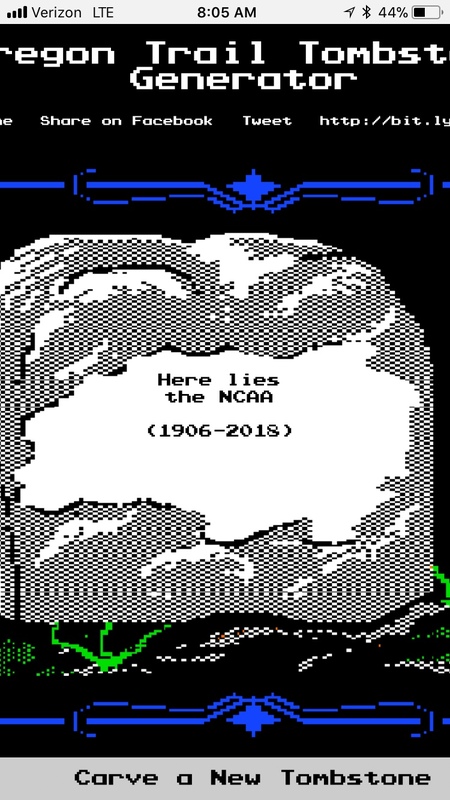 I think that I am ready for a day without revenue college athletics. It`s time to adopt club sports as the means to develop players for the pros. The universities have proven themselves incapable of policing themselves. Last edited by paintmered; 01-27-2018 at 11:30 AM.